Volunteer litter pickers braved the rain earlier this week to celebrate the arrival of the city’s first Superbin. 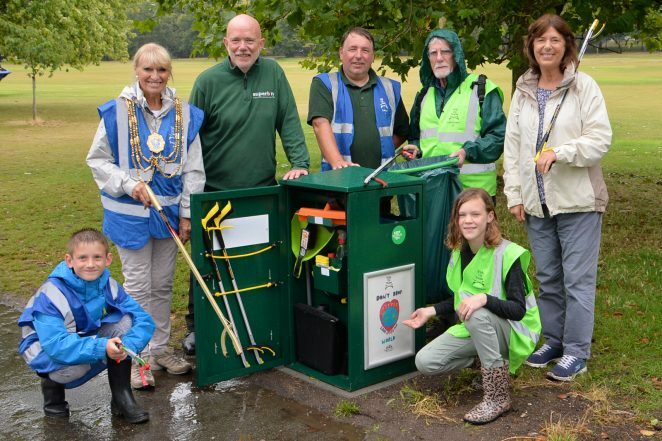 The bin, in Preston Park, was unveiled as part of the Mayor’s Big Tidy Up event. Volunteers from the city’s Tidy Up Team were joined by the Mayor of Brighton and Hove, Dee Simson, Environment Councillor Gill Mitchell, bin designer Ian Lilley and park rangers, to test the new bin, and litter pick in the popular park. At first glance, the Superbin looks like a normal litter bin, but open the door at the back, and you’ll find a stash of litter picking equipment for use by volunteers. The bin has been installed as part of the council’s Tidy Up Team project. Trained volunteers are given a code to the bin store, where equipment including litter pickers, gloves and bags are kept. The council launched the Tidy Up Team last year in a bid to encourage local people to help keep their parks and green spaces tidy by taking part in, and organising litter picking events. The scheme is co-ordinated by Cityparks staff and supported by Cityclean and local community groups. The council runs monthly training courses for volunteers to become Tidy Up Team members, so they can safely collect litter in their local parks and green spaces. As a result, litter picking events are now taking place regularly across the city, run totally by volunteers. If you are interested in getting involved please fill out the Volunteer for the Tidy Up Team form. You’ll then be added to the waiting list for training and as soon as space is available you will be contacted with further information. If you have any questions please email cityparks.volunteers@brighton-hove.gov.uk or call 01273 292929.